From the beginning, Israel’s establishment relied on the backing of the imperialist powers. Zionist settlement in Palestine was initially supported by Britain, which took control of the Middle East after the First World War. Zionist leaders won British support by offering to help put down any revolt against British control by the Palestinian population. The Balfour declaration of 1917 saw Britain promise to support, “the establishment in Palestine of a national home for the Jewish people”. From its inception, the Zionist project of creating Israel as, “a purely Jewish state”, was justified as delivering, “A land without people for a people without a land”. However, no such land “without a people” existed. Israel was only established in 1948 through the ethnic cleansing of 750,000 Palestinians. The Six Day War of 1967 was an extension of this process. Around 430,000 Palestinians were forced to flee into Jordan because of the war, some who had already fled historic Palestine in 1948. Another one million Palestinians came under Israeli control, in the occupied territories of West bank, Gaza strip and east Jerusalem. The end of the Second World War saw Britain begin to retreat from direct colonial control of the Middle East in the face of an upsurge of anti-colonial struggle. In 1952 Gamal Nasser led a coup in Egypt that effectively ended British control. He became a symbol of resistance to European colonialism and the figurehead of a new Arab nationalism. His push for Arab unity led to a union between Syria and Egypt that was established in 1958, although this union was short lived (ending only three years later). Nasser’s popularity skyrocketed when he nationalised the Suez Canal in 1956. He denounced British imperialism and the profits it reaped from the canal, and asserted the right to Egyptian sovereignty over their own water way. A British and French effort to invade Egypt in retaliation, with the support of Israeli troops, failed. Western imperialism’s hold on the Middle East, and its control over the region’s vast oil reserves, was under threat. In 1945 the US had replaced Britain as the world’s leading imperialist power. But the US was concerned that supporting Israel too strongly would alienate the Arab states, where it also wanted to maintain influence. So Israel had to make itself indispensable to the US as a defender of Western imperialism in the region. “The feudal regimes in the Middle East have had to make such concessions to the nationalist movements … that they become more and more reluctant to supply Britain and the United States with their natural resources and military bases… Strengthening Israel helps the Western powers maintain equilibrium… in the Middle East. The establishment of the state of Israel in 1948 had been a humiliation for the whole Arab world. So it was clear the rising tide of anti-imperialism would lead to a renewed clash between Israel and the Arab states. In the lead up to the 1967 war, Israel started bringing UN sanctioned demilitarised areas in Jordan and Syria under cultivation and farming. This was a surreptitious effort to seize more land. When an Israeli tractor appeared on the shared zone, Syria launched a mortar attack. The Syrians viewed Israel’s act an intentional provocation. Israel responded to this mortar attack by unleashing tanks, artillery and fighter jets to destroy Syrian army positions. On 11 May, Israeli general Yitzhak Rabin declared, “The moment is coming when we will march on Damascus to overthrow the Syrian government”. In response, the Egyptian Prime Minister Nasser sent two battalions to Sinai and, on 23 May, ordered the closure of the Gulf of Aqaba (just below the Sinai Peninsula) to stop Israeli shipping. At 8:30 am on 5 June an Egyptian plane carrying field marshal Abd-al-Hakim Amer took off over the Sinai Peninsula. Egyptian gunners were told not to fire while he was airborne. Within minutes, Israeli planes launched a surprise attack. 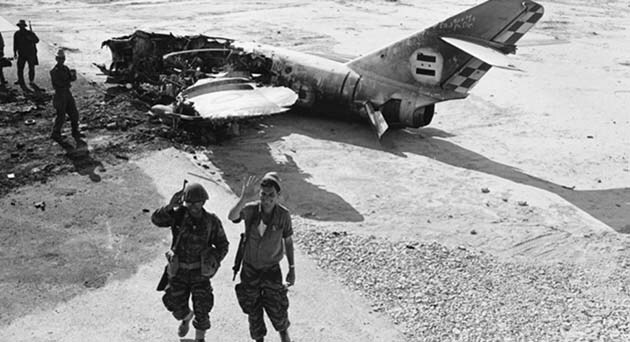 The Egyptian air force was completely decimated within a few hours. Only one day later Israeli forces managed to seize the Gaza strip from Egypt. Jordan, Syria and Iraq all joined the war, launching attacks on Israel. Within days Israel had defeated Jordan, capturing the West Bank and East Jerusalem, including the Old City containing the Al-Aqsa mosque and the Wailing Wall. Israeli forces relentlessly charged through the Sinai Peninsula, pushing Egyptian forces through to the Suez Canal. As Israeli forces flew over Egypt unchallenged, Nasser realised that Egypt’s defeat meant a defeat for the whole Arab alliance. Nasser cabled Syrian forces instructing them to agree to the United Nations sponsored ceasefire in the hope of saving Syrian forces from defeat. Nasser’s warning to the Syrians came too late. Although the Syrian government requested a cease fire at 3:20 am on 9 June, Israeli forces advanced towards Damascus, taking the Golan Heights. It wasn’t until the following day that Israeli forces halted at Quanitra and accepted the cease-fire. For the Palestinians, the result of these six days meant a repeat of 1948, with thousands more Palestinians fleeing to the already packed refugee camps of Jordan, exiled from their homes. Perhaps one of the greatest losses of the war was the fact that it displayed the lack of power of the Nasser regime in Egypt. Although Nasser had acquired weapons from the Soviet Union, in a purely military confrontation the Arab forces were no match for Israel. In despair, Nasser announced his resignation. Within hours thousands took the street, demanding Nasser stay. One writer described the scene, “The streets of Cairo were flooded with more than two and a half million… And its slogans could not be misunderstood: ‘No imperialism, No dollar’.” But the scale of the military defeat was clear. The defeat of Arab nationalism allowed Israel to greatly expand its borders, turning Gaza, the West Bank and East Jerusalem into Occupied Territories. Israel has made life here for Palestinians a misery, expanding settlements that have stolen water reserves and land, and imposing military check-points that disrupt daily life. Immediately after the war, United Nations Security Council resolution 242 requested that Israel withdraw from the occupied territories, noting their seizure was illegal under international law. But Israel refused to comply, and the US has vetoed subsequent resolutions aimed at enforcing its withdrawal. The 50 year occupation continues to this day. As a result of the six day war, Israel proved its worth as a watchdog state for the US in the Middle East. It was after 1967 that the US threw its support wholeheartedly behind Israel, pouring huge amounts of military “aid” into the country. Israel has received more US military aid that any other country in the period since 1945. Since 1987 the US has provided at least $2.4 billion annually, increasingly steadily over time. Last year, the US agreed to give Israel another $50 billion over the next decade. It has secured privileged access to advanced US weaponry, as part of a US pledge to ensure Israel maintains a “qualitative military edge” over other military forces in the region. In effect, Israel has become an extension of the US military. This has helped put militarism at the very core of Israeli society, shaping it into effectively a military garrison serving US interests. The scale of imperialist support for Israel means that only a region-wide struggle against imperialism is capable of defeating it. The 1967 war represented the failure of the new Arab ruling classes to defeat Israel through military means. Today the main Arab ruling classes have long since made their peace with Israel and the US. It will take a revolutionary struggle across the Middle East, based on the power of the working class in countries like Egypt, Jordan and Syria, to successfully challenge Zionism, imperialism and the capitalist interests behind them.